This is our first winter in Donegal and we are in the learning stage of using our fireplace. There are a few options that we can decide from to heat our cottage. The first and the simplest one is to have some kerosene delivered. We have a tank out behind our shed and a timer inside to control it when to come on and off. We decided that we weren’t going to use that option this year because we want to see how the fireplace works. 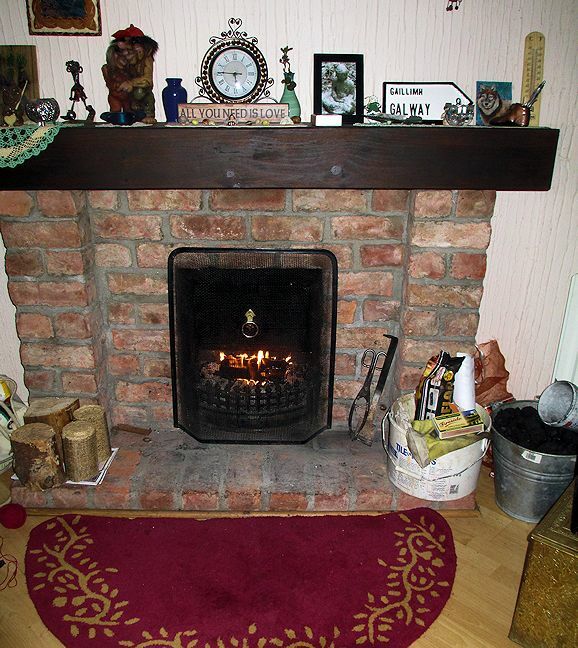 The fireplace has a back burner which will heat our water and radiators, it just takes longer than the kerosene (2+ hrs). Anyway, we’re not people who like lots of heat. Lately we been firing up the fireplace around 4pm and keep it going till around 10-11pm. It provides us with the warmth and is not overbearing. There are also numerous choices on what to burn. 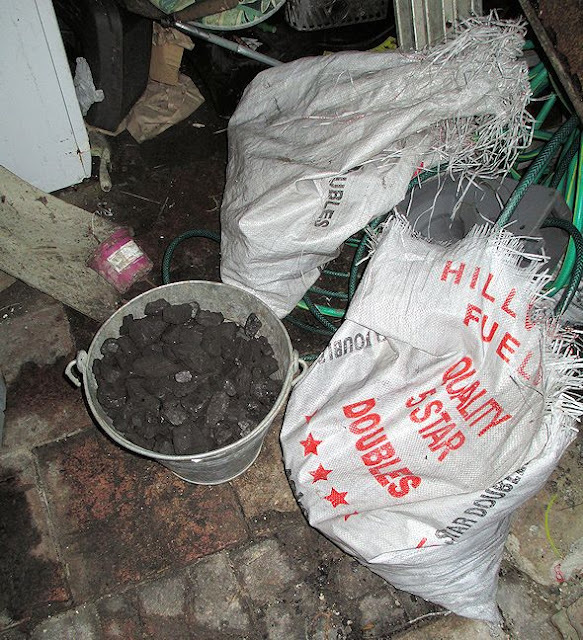 Briquettes, wood and coal. We have been doing a combination of all three and that seems to be efficient for now. The coal burns the hottest and if you place the briquettes or wood on top of that, it burns nice and steady. Winter temperatures here are not the coldest we have experienced such as in Maine and Fairbanks, Alaska. Actually, the temps feel like spring but the nights do get colder and generally remain above freezing. Other factors are rain and wind. So we will see how this winter goes for us. We just started using the fireplace a few weeks ago and are learning what works best for us. As for now, it’s a little bit of everything. SuperValu advertises what they sell. It's very close to our cottage and we have a small shopping cart that we can use to haul the stuff back home. Our neighbor has a supplier that will deliver the coal up to us so we don't need to buy that down at the store. 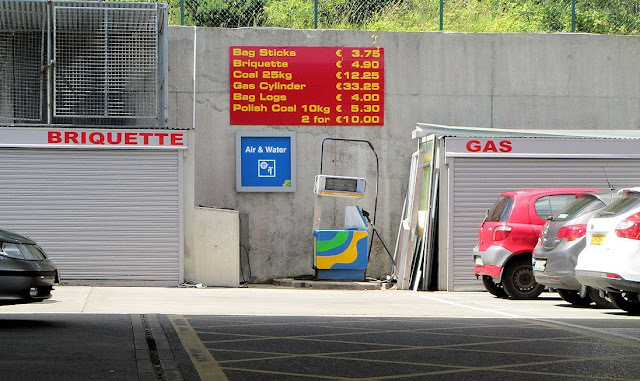 The other items can be purchased at Aldi's and Lidl's down in Donegal Town when our neighbors drive there to shop plus the items are a little bit cheaper. Polish coal is not allowed in this area so the sign is a little outdated. Prices are right though. The coal comes in a 25kg bag. We usually fill the pail up and bring it inside. Doesn't smell at all. Neither Shari or I couldn't believe that people still use coal these days but a lot still do. 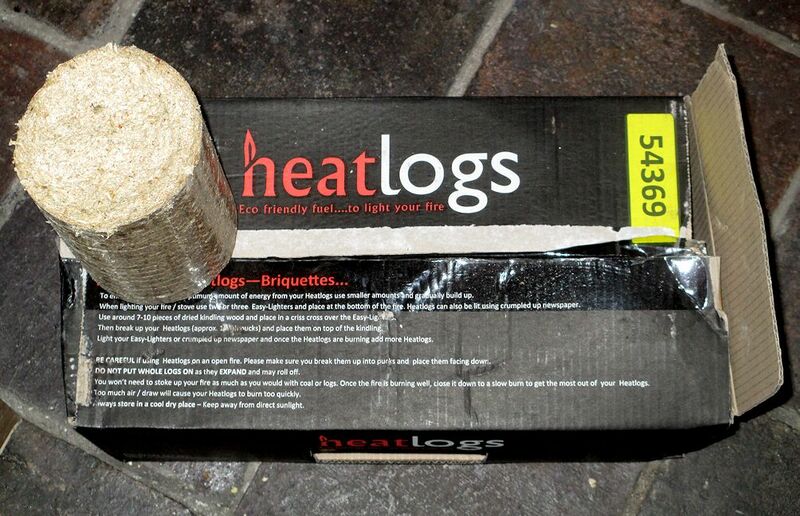 We sometimes use a heat log when the fire is going good. It is made of compressed sawdust. Wood logs, compressed sawdust log and a fire starter log which burns for 2 hours and we sometimes use to get the fire going fast. 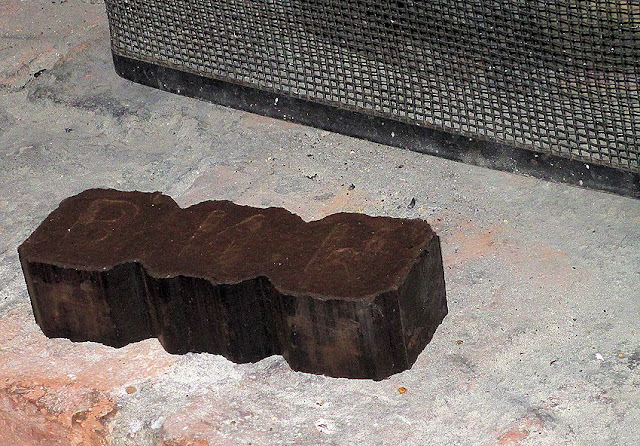 Then we add the wood or briquette and sometimes coal. 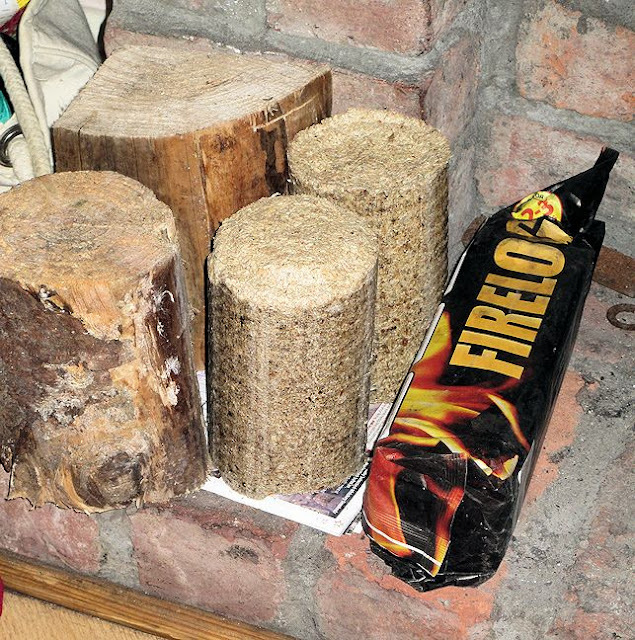 The briquette comes in a bundle of 20. Once they start to burn, they break up in layers. They last about an hour and smolder a bit longer before they are gone.